– Sunday 29th April live at The Old Blue Last, London. FREE ENTRY SHOW. – Friday 28th September live at Sneaky Pete’s, Edinburgh. Supporting Chains of Love. – Friday 5th October live at The Wee Red Bar, Edinburgh. – Monday 8th October live at Electric Circus, Edinburgh. Supporting Palma Violets. – Saturday 27th October live at Cabaret Voltaire, Edinburgh. – Saturday 10th November live at Sneaky Pete’s, Edinburgh. – Thursday 15th November live at King Tut’s Wah Wah, Glasgow. Supporting Fierce Panda duo The Crookes & Hey Sholay. – Wednesday 28th November live at The Caves, Edinburgh. Supporting Skinny Molly (Mike Estes from Lynyrd Skynyrd). – Friday 14th December live at The Wee Red Bar (College of Art) Edinburgh. – Friday 15th March live at The Wee Red Bar (College of Art),Edinburgh. Support from Trapped Mice & The Asps. – Saturday 23rd March live at Nobles, Leith, Edinburgh. – Saturday 13th April live at Electric Circus, Edinburgh. – Monday 29th April live at King Tut’s, Glasgow. Supporting Dingus Khan (Fierce Panda Records). – Friday 3rd May live at The Wee Red Bar (College of Art), Edinburgh. Support from Glassbooks, Dusty Keys & Seven Summits. – Saturday 8th June live at Stereo, Glasgow. Support From Mellonstomp, Parker & Dear Lara. – Friday 14th June live at The Wee Red Bar (College of Art), Edinburgh. Support From Trapped Mice & We Came From The North. – Friday 9th August live at Sneaky Pete’s, Edinburgh. Support from Pirate Sons & The Litigators. – Thursday 15th August live at Broadcast, Glasgow. Support from Behold, the Old Bear & Cafe Disco. – Saturday 31st August live at Liquid Rooms, Edinburgh. – Tuesday 3rd September live at Bar Bloc, Glasgow. – Saturday 26th October live at King Tut’s, Glasgow. Supporting The Electric Soft Parade. – Wednesday 20th November live at The Caves, Edinburgh. Support from The Deadly Winters & Save The Reckless. – Saturday 23rd November live at Tipsy, Dalston, London. Support from Molly Wagger &amp The Rope &amp The Colt. – Saturday 22nd February live at Broadcast, Glasgow. Supporting The Orwells. – Friday 28th March live at Sneaky Pete’s, Edinburgh. Supporting Coasts. – Saturday 5th April live at Liquid Room, Edinburgh. – Tuesday 3rd June live at Electric Circus, Edinburgh. Supporting The Orwells. – Monday 11th August at The Old Blue Last, London ‘British Flag’ EP Launch show support from Molly Wagger & White Heath. – Saturday 23rd August at Sneaky Pete’s in Edinburgh. ‘British Flag’ Launch show support from White Heath & Trapped Mice. – Friday 5th September at Voodoo Rooms in Edinburgh (This Feeling Show). – Tuesday 7th October at King Tuts, Glagow. Supporting The History of Apple Pie. – Sunday 16th November at Sneaky Pete’s, Edinburgh. Supporting The Voyeurs. – Wednesday 26th November at Broadcast, Glasgow. Supporting Hinds. – Friday 27th February live at Electric Circus, Edinburgh. – Tuesday 14th April live at The Stillery, London. – Thursday 23rd April live at Broadcast, Glasgow. – Friday 8th May live at The Wee Red Bar, Edinburgh. – Saturday 1st August live at The Caves, Edinburgh. – Saturday 29th August live at The Barrels, Berwick upon Tweed. – Sunday 20th September live at Electric Circus, Edinburgh. w/ Balthazar and Made Violent. – Thursday 19th November live at Teviot Underground, Edinburgh. – Saturday 19th December live at Sneaky Petes, Edinburgh. w/ Mt Doubt. – Saturday 2nd April live at Electric Circus, Edinburgh. – Wednesday 5th April live at Leith Depot, Edinburgh. Supporting Heavenly Records The Orielles. – Sunday 23rd April live at The Mash House, Edinburgh. 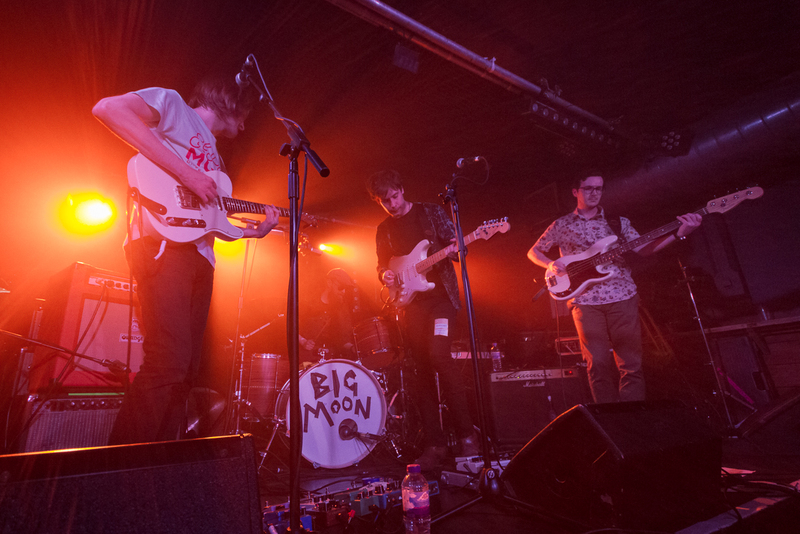 Supporting Fiction Records The Big Moon. – Saturday 27th May live at Henry’s Cellar Bar, Edinburgh.